Tsunamis in the Caribbean? It’s Possible. Two days before the devastating tsunami in the Indian Ocean on Dec. 26, 2004, two Woods Hole geologists reported that similar earthquake- and tsunami-generating conditions exist in the Caribbean Sea. The Indian Ocean tsunami was caused by a magnitude-9.3 undersea earthquake in a deep-ocean trench off the Indonesian island of Sumatra, where two of Earth’s crustal plates collide. Another earthquake, with a magnitude of 8.7, occurred March 28 along the same trench, about 120 miles to the south. Just like Sumatra, the islands of Puerto Rico, the Virgin Islands, and Hispaniola are located near earthquake-prone deep-ocean trenches. A large fault on Hispaniola bears a striking resemblance to a fault on Sumatra. In a study published Dec. 24, 2004, in the Journal of Geophysical Research, Woods Hole geologists Uri ten Brink and Jian Lin reported a heightened earthquake risk from the Septentrional fault zone, which cuts through the highly populated Cibao valley in the Dominican Republic. The potential for earthquakes of magnitude 7.5 or greater in the trenches offshore Puerto Rico and Hispaniola pose additional risk. While tsunamis are rare in the Caribbean, earthquakes are not. A dozen earthquakes of magnitude 7.0 or greater have occurred near Puerto Rico, the Virgin Islands, and Hispaniola in the past 500 years. Several have generated tsunamis, the most recent in 1946 following a magnitude-8.1 earthquake off the northeast coast of the Dominican Republic, which killed more than 1,600 people. With nearly 20 million people now living in this tourist region and a major earthquake occurring about every 50 years, Lin and ten Brink say it is not a question of if another major earthquake will happen but when. The risks of major earthquakes in the Caribbean, and the possibility of a resulting tsunami, although small, are real and should be taken seriously, said Lin, a senior scientist in the WHOI Geology and Geophysics Department, and ten Brink, a geologist at the U.S. Geological Survey in Woods Hole and an adjunct scientist at WHOI. Earthquakes typically occur near faults, or fractures, in Earth’s crust where rock formations—driven by the movements of the tectonic plates that make up Earth’s surface—grind slowly past each other or collide. Stress builds up, and at some point, stress overcomes friction, and the rocks slip suddenly, releasing seismic energy in the form of an earthquake. That alleviates stress in one area, but raises it elsewhere along the fault line. Most of these faults lie on the seafloor, so 80 percent of earthquakes occur in the ocean. Occasionally, the sudden rupture and movement of the crust can displace thousands of meters of water, setting in motion great tsunami waves. 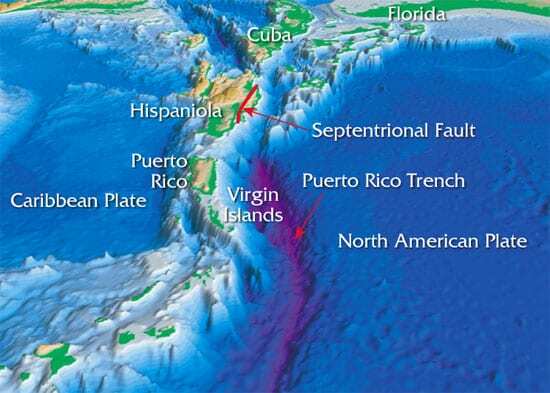 Hispaniola, Puerto Rico, and the U.S. Virgin Islands sit atop a small crustal block that is sandwiched between the Caribbean Plate and the North American Plate. The latter plate is being thrust down and under the Caribbean Plate to create a deep-ocean trench, called a subduction zone. The Puerto Rico Trench is about 900 kilometers (560 miles) long and 100 kilometers (60 miles) wide, and it runs roughly parallel to the northern coast of Puerto Rico, about 75 miles offshore. It is the deepest point in the Atlantic Ocean, descending 8,340 meters (27,362 feet) below the sea surface. 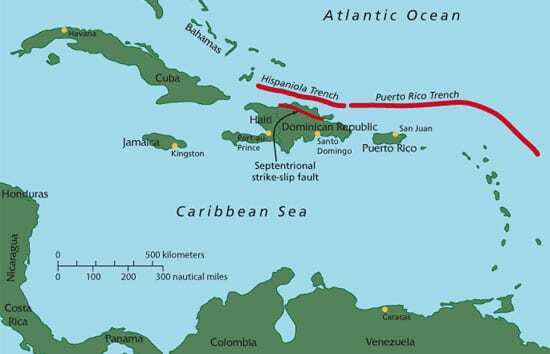 The Hispaniola Trench, which parallels the north coast of the Dominican Republic and Haiti, and is 550 kilometers (344 miles) long and 4,500 meters (14,764 feet) deep. The two scientists studied historical earthquake data and the geology of the northern Caribbean plate boundary, and then used three-dimensional models to calculate the stress changes in and near the trenches after each earthquake. Lin said that each time an earthquake occurs on the Puerto Rico and Hispaniola trenches, it adds stress to the Septentrional fault zone on Hispaniola. The region has a long history of destructive earthquakes. Major earthquakes, greater than magnitude 7.0, have damaged Puerto Rico 13 times since 1670, with three of the events accompanied by destructive tsunamis. The Puerto Rico and Hispaniola trenches are not the only tsunami threats on the Atlantic coast of the Americas. In 1755, an earthquake in an undersea fracture zone off Portugal generated a giant tsunami that reached as far as the Caribbean region. It killed more than 100,000 people, destroyed the city of Lisbon, undermined Portugal as a rising European power, and had a profound impact on the philosophical and religious thinking of the era. Tsunamis can also be generated by submarine landslides, ten Brink noted. In 1998, a magnitude-7.1 earthquake occurred 24 kilometers (15 miles) offshore Papua New Guinea. It was not large enough to generate a tsunami directly, but it caused an undersea landslide that caused a tsunami 12 meters (40 feet) high, which killed some 2,200 people.